I know you're both sitting next to your telephones just waiting for me to ring. Unfortunately I've lost your private contact numbers, so here's the information you've been waiting for. 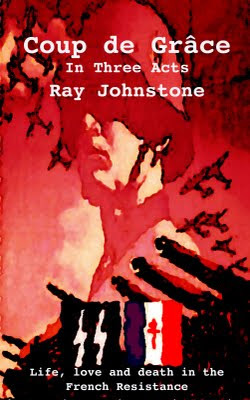 A film script of my novel "Coup de Grace" will be available in book form later this year - or early in 2010. But in this three act adaption, many changes have been made, firstly from the precise screenplay format that is required by you film industry professionals - and secondly to the story line which has been fundamentally modified. The most important of these alterations is the ending. I felt the need to change this quite dramatically for a film script, in order to make it more visual - and it now has a completely different denouement from the one in the book. I only realized afterwards of course, that once you take a hatchet to a novel with the intention of removing large chunks of it, there are many unforeseeable consequences. 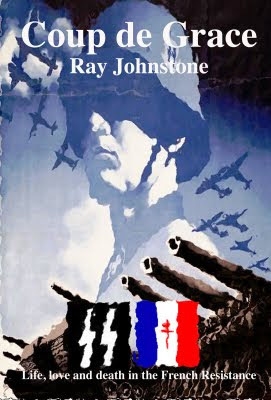 For one, the story went off in a different direction, and this required the elimination of several major and minor characters who appear in the novel, as well as many of the incidents that I had used in an attempt to create the ‘spirit of place’ in France before, during and after the two World Wars. However, when this was done, some holes were left in the narrative, and I immediately saw that I now needed to add several new scenes, and introduce a few more characters, both for continuity and to propel the story forward. At this time, I also became interested in the ‘heroic’ nature of survival, and some of the traits of the two main characters have been swapped. I hope the result of these alterations will make this version more readable for those not associated with the movie industry. 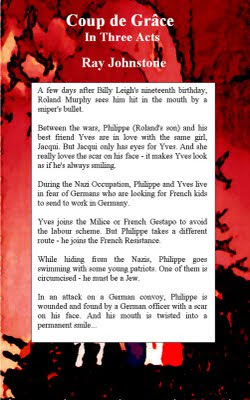 I have been working on the novel and the screen versions of Coup de Grâce ever since I arrived in France ten years ago. The idea first came to me when I stumbled across a roadside memorial near my home in a small town in Gascony. It marks the spot where a young boy was shot by the departing Germans a few months before the war ended, and I felt perturbed that such barbarity could have taken place in this idyllic part of France just over sixty years ago. But a glance at the headlines or TV news on any day will remind everyone that this kind of savage act is still endemic throughout the world. Although this book is a work of fiction, everything (well almost) is based on actual events. It is graphic and crude and violent, and it contains, I hope, not a jot of romanticism. The twin themes of the story are, I suppose, collaboration and resistance. These are complicated issues, and there were many shades of both. For those of us - like me - who have never lived in an occupied country, they can be especially difficult ideas to unravel. But through some of the fictionalized events described, I hope I have been able to provide an insight into how complex and dangerous the dark years of Nazi occupation were for the people of France. However, although my sympathies are categorically and wholeheartedly with the French, it would be folly for anyone to believe that evil attaches itself exclusively to one side in any conflict. In war there are no winners, and in Coup de Grâce, good does not triumph over evil - the price for treachery is seldom exacted - and brutality is meted out equally on both sides in the struggle for Liberation. Without belaboring the point, I hope the unrelenting anti-war theme, as well as the idea that prejudice is universal, both come through loud and clear. Finally, I must add the warning that this play based on my novel, and it will not be to everyone’s taste. Strong language is common in the dialogue, some of the characters express decidedly anti establishment views, and there are several graphic sexual scenes that some readers may find offensive. But I guess you've both used a bit of all of these elements in most of your movies. Please go to my website to find out where to send the thousands you're going to offer me for this script. The printer has just notified me that the novel I've been working on for about ten years will be available shortly. (I'll post further information on how to get hold of it as soon as I have the specifics). Above is the front cover that I designed, which as you can see, is based on a Nazi recruiting poster. I've added Charles de Gaulle's symbol of a free France, the Cross of Lorraine, which was used by the French Resistance - as well as an SS symbol, because the notorious German division Das Reich also plays an important part in the story. This is not a book for everyone. Coup de Grace is a book about war - and the dreadful, bloody and barbaric things that happen in war are presented in the bluntest manner. Many of the characters express decidedly anti establishment views. There are several graphic sexual scenes which may not be to everyone’s taste. And the overall theme is decidedly and unashamedly anti war. As I've said above, some people may have problems with this book, but for those of you who would like to make up your own minds, more information will be posted as soon as I have it. It's mid summer and the sun beats down creating wonderful contrasts between the dazzling light and the inky black shadows. The amazing gothic church St Jean-Baptiste dominates the medieval village. On the right, you can see the imposing Mezin Marie, or town hall. The baker Manaberra is on his way from his oven to his shop. He's been baking bread since before midnight. This view of Mezin is now high above the harbour in a high rise in Kowloon because a few years ago a couple who both live and teach in Hong Kong bought this painting for their appartment. 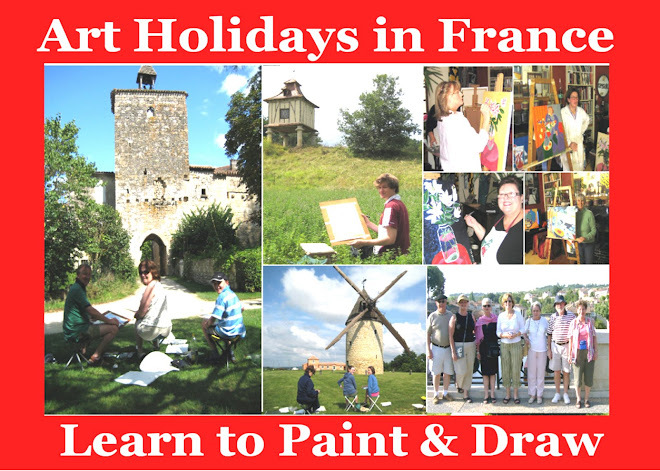 If you'd like to paint this view, why not consider an art holiday in France. For more information, please send me an email. According to a French historian who visited us one day, our home in Mezin, La Petite Galerie, was built at about the same time as St Jean-Baptiste, the village church. Probably at the beginning of the 12th century. This makes them both about 800 years old. And it makes them both examples of ROMANESQUE architechure. At the risk of seeming pedantic, the Romanesque period lasts from the middle of the 10th Century (around 930-975, depending on which part of Europe you are in) to the beginning of the 13th Century. Most guidebooks will provide those interested with the basic features to look for when identifying Romanesque church architecture: a central nave with isles, barrel vaulted roofs (on most early examples), the development of clearstory lighting (sometimes spelt "clerestory" just to confuse you) to light the nave, and the transition to the Gothic when the rounded arch (copied directly from Roman originals - as in Rome in the days of the Romans) became pointed (in order to more effectively overcome the problem of supporting the enormously heavy stone roofs). When travelling in France, however, one needs to be careful about the English translation of the French word for "Romanesque", as it is often mistranslated. In Britain, Romanesque is usually simply described as "Norman". But in French the style is known as "Roman". Unfortunately, this word is often incorrectly translated into English as "Roman", making English speakers think about the Roman Empire, a period at least a thousand years before the Romanesque period. In French, the word for this period (when Charlton Heston was racing charriots around the Colluseum and where Christians were fighting lions when Charlton wasn't using it) is Romain. 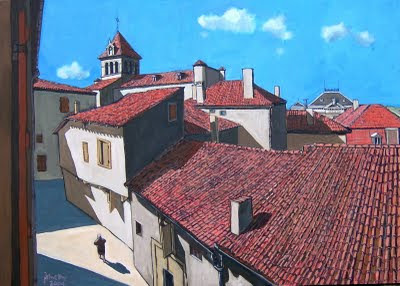 The painting above is a view of St Jean-Baptiste from my studio window. The guy in the bottom foreground is the baker who bakes his bread in the Renaissance buliding (Wow! Now we're on to 15th Century domestic architecture) opposite La Petite Galerie. He's asleep on a bench outside his oven - because he's been hard at work baking since before midnight. We wanted to go to the north coast of Spain for an end of summer break. It's only a couple of hours away from us, but El Tiempo said it was raining in Euskal, which is what the Basques call the Basque country. So we wen to the Med, which is a bit further, but well worth it for the wonderful sun - which is almost guaranteed in that part of the world. On the way we went to Collioure in France (where the Fauves painted) and then on to the Port de la Selva, just across the border in Spain. Here we discovered the amazing Monastery of St Pere de Rhodes. Although it's close to the coast, it's so high up that if you stand on your tippy toes you can see the Sydney Opera House in the far distance. Pictured above you can see: my pen and ink interpretation of the nearby chapel, as well as one provided by our Canon. We also visited Dali's house at Port Lligat near Cadaques. Needless to say, we stopped off to pick up some wine every now and then. I wondered why the campervan was so sluggish coming back, but when we got home we counted the bottles.